Refoulement and Last Resort continue a body of work begun about asylum seekers with Someone died trying to have a life like mine, taking up the issue on our shores. 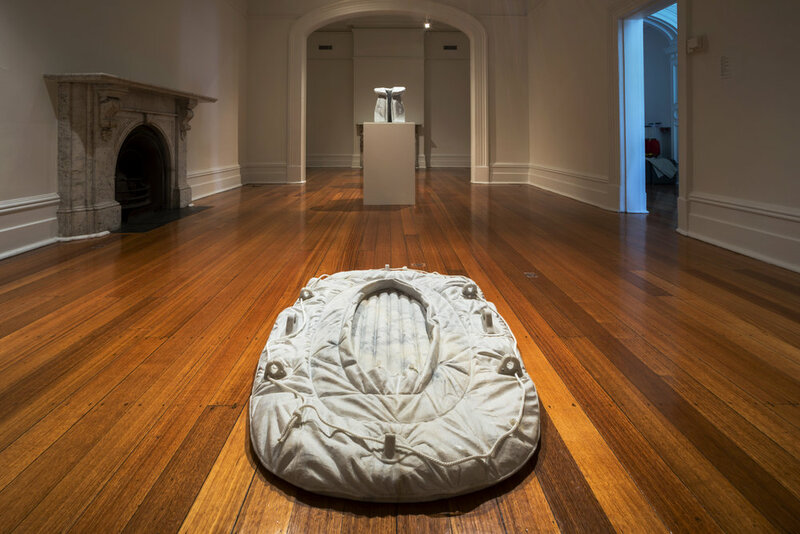 The body of work that composes these exhibitions was shown across four galleries in 2014-15: Sullivan+Strumpf, Sydney; McClelland Regional Gallery & Sculpture Park; Linden Centre for Contemporary Art, Melbourne; and Rockhampton Regional Art Gallery. Each of these exhibitions asked us to consider the attempts of people to reach Australia at great personal risk, and the safety and privilege in which we live our day-to-day lives. The works do not offer simple readings of the complex and problematic issue of asylum seekers. Rather inflatable life boats and palm trees embody the double standard at the heart of the issue; they are both rock solid and full of hot air. Upright life jackets stand for the individuals risking their lives at sea to reach our shores, each with their own story.